People in Paris are dying unusual deaths. They are being beheaded by the ghost of Marie Antoinette. That’s got nothing to do with Colette’s school trip to Paris, right? Wrong. This unlikely tale of French history mixed with the supernatural and a bit of contemporary sleuthing is founded on friendships past and present, good and not so great. Collette hasn’t told her wealthy status-obsessed friends she’s been penniless since her parents’ separation. Her mother has saved for months so that Collette doesn’t miss out on the class trip to Paris. When packing, Collette stumbles upon a family heirloom, a medallion, which she decides to take with her to Paris. Perhaps she’ll use it to find out about her French roots. With that seemingly innocuous act, Collette is irrevocably drawn into a world of ghosts, murders and a little bit of romance, but will she survive? I had my doubts. Then again, I wondered why she’d put up with the schoolfriend from hell for so long, too. Katie Alender has a knack for making the pages fly. 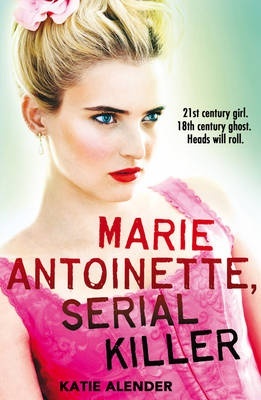 Marie Antoinette, Serial Killer is the perfect escape novel when life, and friends get too much.